In this season of giving thanks and spreading good cheer, individuals and organizations are coming together for #GivingTuesday, a day-long movement to celebrate charity and generosity around the world. 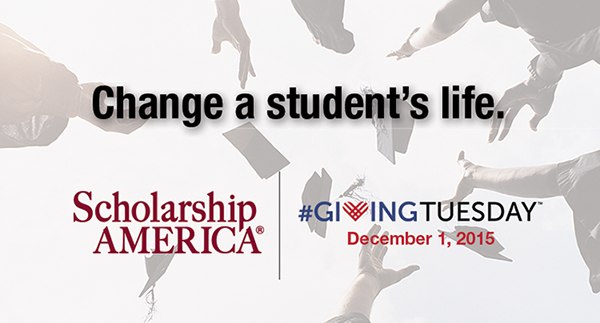 On Dec. 1, you can join Scholarship America for #GivingTuesday to help ensure that students finish their postsecondary education. The United States isn’t producing enough college graduates to stay competitive. The types of jobs that students pursue – and the type of workers that the country needs – increasingly require a postsecondary education. By 2025, nearly two-thirds of jobs will require training beyond high school, according to Georgetown University’s Center on Education and the Workforce. That means our nation will require 11 million more postsecondary credentials than we’re currently on track to produce. Student debt is at an all-time high. At $1.2 trillion and counting, loan debt is affecting a generation of students who find that college is getting harder and harder to afford. Student loan debt represents the second-highest amount of debt in the U.S., even surpassing car and credit card debt. Making higher education attainable and affordable gives students greater chances to reach their educational goals. “Nontraditional” is becoming the norm. No longer are the majority of college students pursuing a four-year degree straight out of high school. With in-person and online training and courses, there are now more opportunities and options for learning than ever before. That means welcoming increasingly diverse classes of students: a parent juggling classes alongside their full-time job; an employee seeking an extra certificate needed to advance at work; a high school senior wanting to start an apprenticeship at their local community college. All of these examples point to an increasingly flexible and robust higher education experience – and scholarships can play a vital role in helping even more students. Overall, college grads have higher average salaries and lower chances of unemployment.. These benefits not only affect a student but can affect their family, their future family and our society. In addition to the financial benefits of completing a degree, graduates are more likely to participate in their community by voting, giving back and living a healthy lifestyle. Education can change a student’s life, but it can change yours, too. For nearly 60 years, we’ve worked directly with students, parents, colleges, businesses and communities to empower people to fulfill their college dreams. In addition to local and national scholarships, we’re working to further engage the private sector to help students overcome barriers to college degrees. 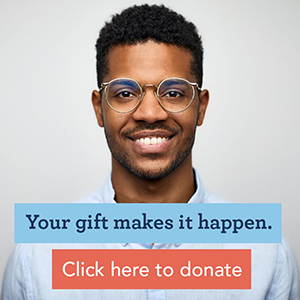 By partnering with Scholarship America, you’re impacting students’ lives today, next #GivingTuesday and for years to come.